In this issue of Wet Paint Magazine we've started up a new series, Q&A with professional artists! This issue we interview cover artist Kristin Olsson! Kristin has also graciously created two step by step designs for you, in fitting with the spring "flowers & butterflies" theme! Do you ever not feel like going to a party and being joyful? This issue is for you! While we are in the business of delivering smiles to our clients’ special events, sometimes joy can be a tricky thing to muster up if we let our life’s circumstances get in the way. Few know this as well as Lori Hurley, who shares her experience with acting joyful when you don’t feel like it. After personally completing a 365 day painting challenge, I decided to not only recap my own experience, but also interviewed a balloon artist and five other painters about their challenges as well. Read on for some inspiration! Who knows, you may decide to take on a creative challenge of your own for 2018! 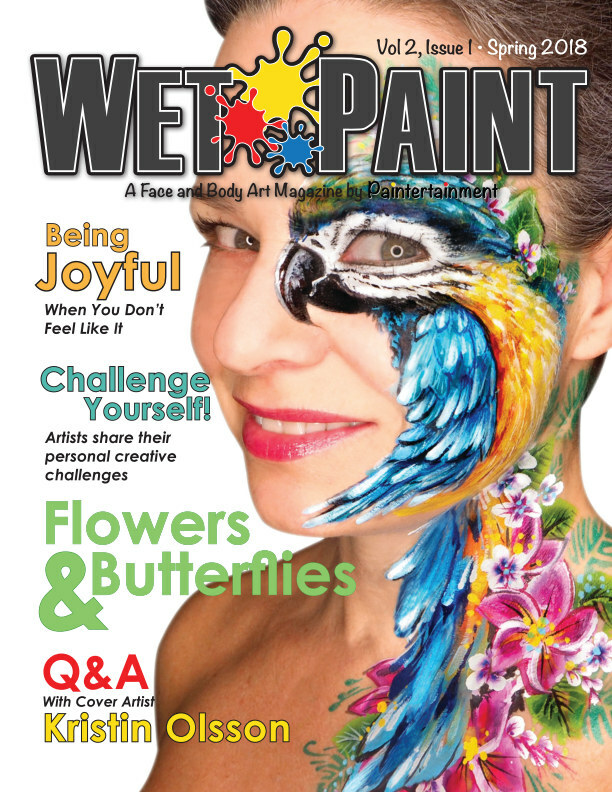 Wet Paint is a magazine designed for face and body artists, both amateur and professionals alike. Published quarterly, we will share articles that are not only relevant to the industry, but aimed at helping our peers to become better artists and business people. Wet Paint magazine is a place for new and experienced artists to connect, share, and lift each other up in this incredibly rewarding field!